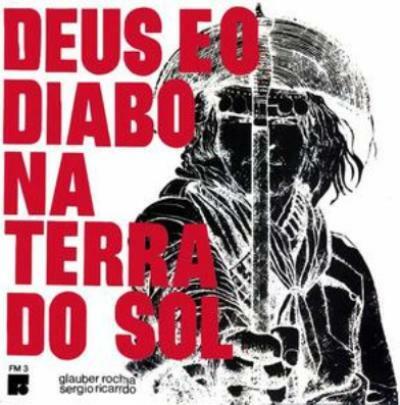 I saw Glauber Rocha's film Black God, White Devil today. The film looks stunning, with black-and-white, almost solarised, photography. At the start, the camera is hand-held and moving frenetically, but later there are some lovely images of desert landscapes and ruined buildings. It's a very slow film, though, with the ritualised action punctuated by long pauses in which the characters simply stand around staring at each other. Most characters also have a knack for speaking with portentous pauses, which slows things down even more. Rocha was the most influential director of Brazil's New Cinema movement in the 1960s, and this was his first internationally-famous film, but the earlier social realist New Cinema films are arguably more important than the theatricality of Black God, White Devil. Film lists like this can broadly be divided into three types. Golden Age films like Gone With The Wind and The Wizard Of Oz, selected by nostalgic film critics with rose-tinted glasses. arthouse films like Pather Panchali and Seven Samurai, which are selected by film directors simply because they always have been. American cinema 1970s+, like Star Wars and The Godfather, which appear at the top of lists voted for by the public. Of these main types, the Vanity Fair one is closest to the 'Classical Hollywood' list. It emphasises classic Hollywood films like Casablanca, Stagecoach, and The Wizard Of Oz. It also finds room for Animal House and Die Hard, though, which is almost criminal considering the films it leaves out (Apocalypse Now, A Streetcar Named Desire...). There are only eight foreign-language films, which is nowhere near enough. Citizen Kane and Battleship Potemkin are almost obligatory on lists like this - if a 'greatest films of all time' list doesn't include these, it can't really be a credible list. Personally, I think 2001: A Space Odyssey and Psycho should also be obligatory, too. Howard Hawks, Francis Coppola, Victor Fleming, Billy Wilder, Michael Curtiz, Jean Renoir, Alfred Hitchcock, and Stanley Kubrick are the only directors who appear twice in the list. I think, in addition, Akira Kurosawa and Orson Welles each deserve another entry. Fritz Lang and Sergei Eisenstein don't appear here at all, because silent cinema is very under-represented. The only silent films included are the comedies The General and The Gold Rush. This is a shame, considering the many experimental silent films available to choose from. I know Vanity Fair is a glamour magazine not an academic journal, but Un Chien Andalou, Metropolis, Cabinet Of Dr Caligari, and Battleship Potemkin are far more important silent films than the two they chose. 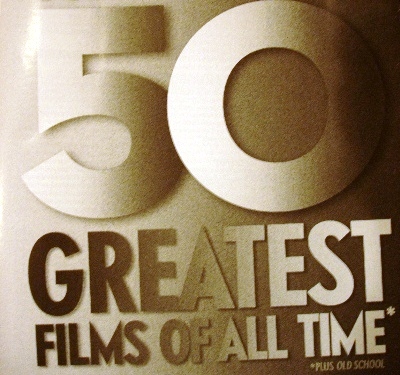 There aren't precisely fifty films on this list - they admit that they (inexplicably) included Old School as an extra guilty pleasure, and (like many such lists) they treat The Godfather and The Godfather II as a single film. Note, by the way, that there are two films called Some Like It Hot: the one on this list is the 1959 comic masterpiece, not the obscure 1939 comedy.